Track and field athletes from across Connecticut came together at Willow Brook Park in New Britain on June 4 for the State Open to decide a champion in each of the 18 events. Naugatuck senior Aren Seeger won the 300 hurdles with a time of 38.00, beating his seeded time of 40.44. 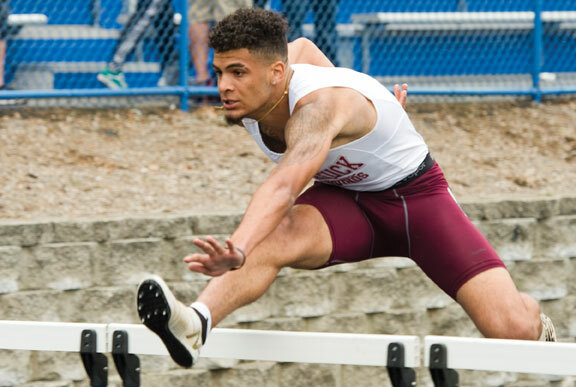 Seeger also placed fifth in the 110 hurdles in 14.69, beating his seeded time of 15.03, and came within fractions of a second from winning the event. Seeger, who was the runner-up last year in the 300 hurdles at the Class L meet and State Open, advanced to compete at the New England championships at the University of New Hampshire, which was June 9. “With a little less celebrating at the finish line Aren could have beaten the state record of 37.63 (in the 300 hurldes),” Naugatuck head coach Ralph Roper said. “But I can understand his exuberance after finishing runner-up last year. Seeger finished third in the 300 hurdles at the New England championships last season. This year, he entered the New England championships ranked first in the 300 hurdles and seventh in the 110, Roper said. The Hawks had a few athletes represent Woodland at the State Open. Craig Starkey finished 12th in the pole vault (12-6), Jasmine Michie finished 11th in the shot put (34-09.75), and Kristen Persico finished 15th in the javelin (101-02).